Tell the Truth and They Think It's Hell! 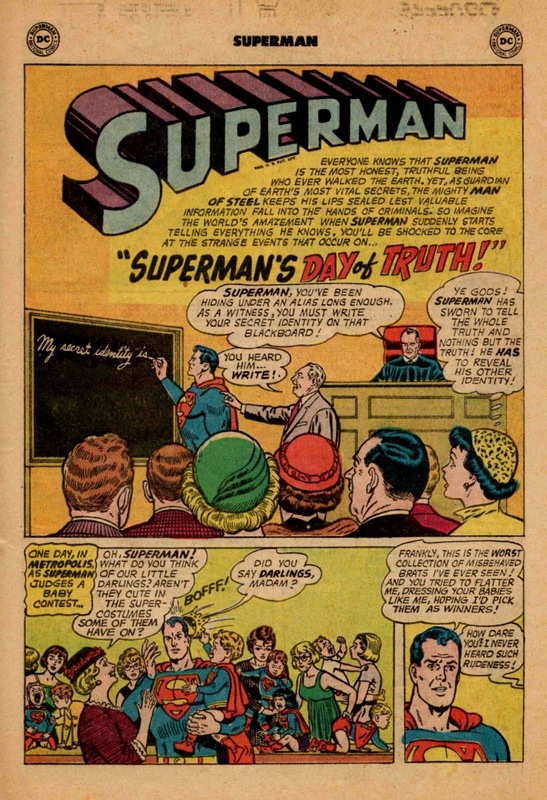 In pages 2 and 3 of "Superman's Moment of Truth!" 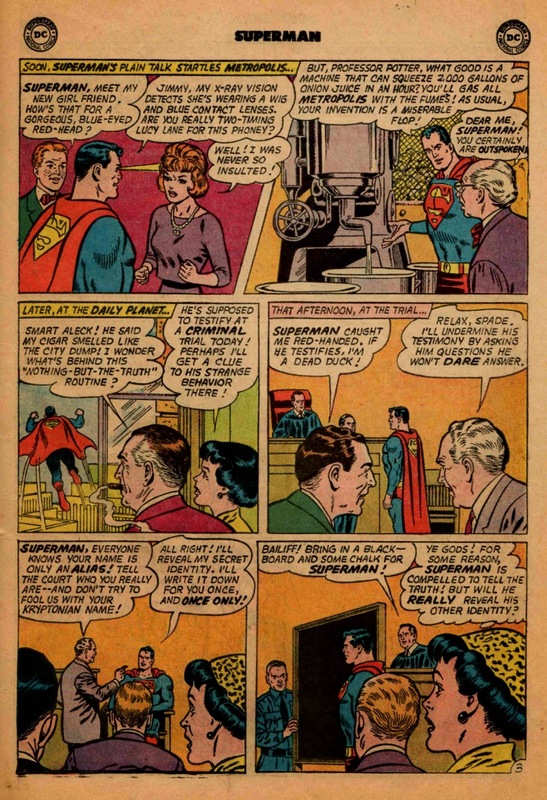 from April 1965's Superman #176, we learn a little more about Superman's sudden attack of truth-telling. And it's not just him, Supergirl, too. Superman tells the truth about a baby pageant from hell, and when Lois upbraids him, he replies that he just told the truth as he saw it. 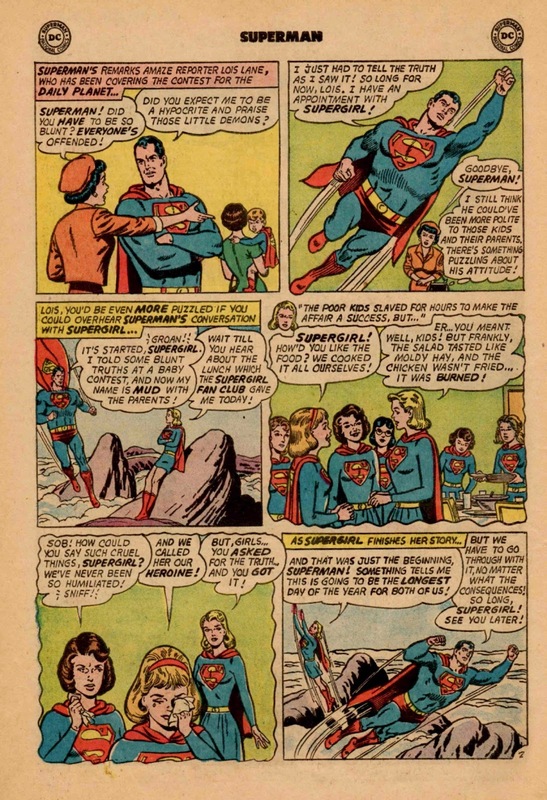 Meeting Supergirl, he hears her tell a similar story about a dinner the Supergirl Fan Club. Well, they DID ASK how she liked the food. AS you can tell from their conversation, this sudden spate of candor isn't something our Super Heroes are doing on a whim. It seems as if it's a duty, a task they must do, if only for today; a day that's "going to be the longest day of the year for both of us!" But aren't we glad that Professor Potter's onion-juice squeezer isn't a facet of every municipal installation? But as we can tell, the "psst -- get a load of this!" (once known as the clothesline or back-fence network) information system works fast! Perry White sort of knew what to expect when Superman laid the stinky truth on him about that ever-present cigar. And that afternoon. when Superman takes his place at a scheduled trial, who knows what will happen to him at the hands of a tricky defense lawyer? Since I'm very experienced in courtroom etiquette (hundreds of hours of Perry Mason, Matlock, Law and Order, and Judd for the Defense), my first thought is: Why doesn't the prosecutor yell, "OBJECTION, Your Honor! Relevance?" 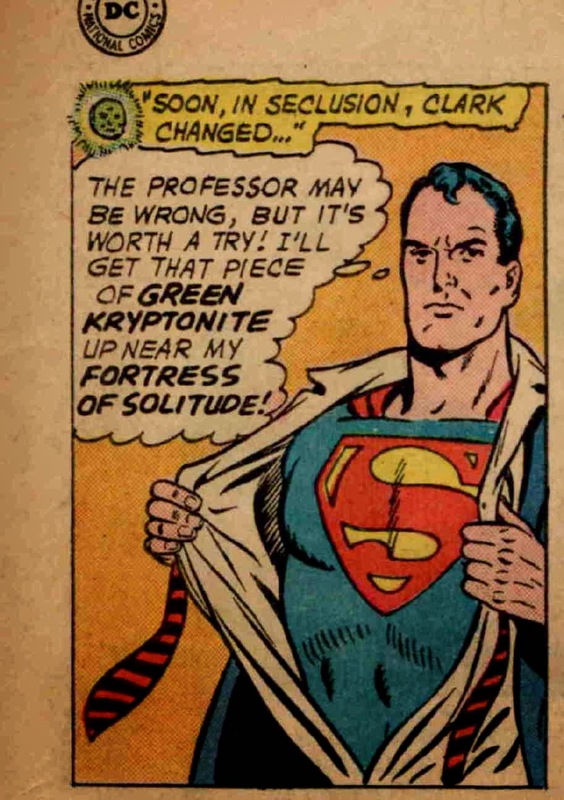 I suppose that our hero's super Kryptonian brain plotted out a few branching possibilities and was prepared for some trick like this, because Supes doesn't bat an eye at the defense attorney's outrageous demand to learn the Secret Identity. Over the weekend, we'll wonder along with Lois ... what will Superman do? Come back Monday to find out, in the next pages of this dynamic Super-Tale! 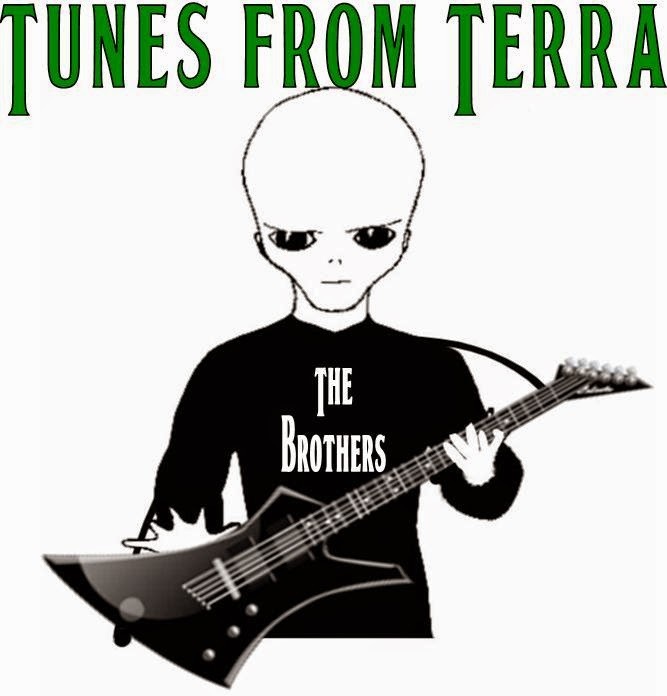 It's time for another ragtag fugitive collection of songs about space, aliens, and other worlds. Some of these tunes are really special in one way or another. I first heard Track Five, "Zoom a Little Zoom," at the age of about six or seven, in my grade-school classroom, on a record about the space age. Thank you, Mrs West, Mrs Lemaster, or Miss Molz, whichever of you it was! The educational record was released in 1959, and titled Space Songs. Track Fifteen is a wonderfully wonky announcement to the world, as if the world didn't already know ... They're Here! Track Sixteen, judging by the record credits, is from a musical. The score for at least this song has been published. Track Nineteen was included as a 45rpm in the original LP release of John Williams' soundtrack for Close Encounters of the Third Kind. Track Twenty-Four is of course a reworking of a song originally from an incarnation of The Flintstones. Track Twenty-Five is the title song from a 1995 off-Broadway musical. This is the next page of Superman #176. The Comic Book Database tells us that "Professor Eureka" ran from 1952 to 1966 in various DC comics. Comic Vine reports that it was another gag strip by Henry Boltinoff. Regarding this particular edition, ain't it just like an egghead to make all these precautions and throw it away like that? The same behavior obtains today as people buy a candy bar and a diet pop, or drive rudely on the highway to make it to church on time. Ah, humanity! 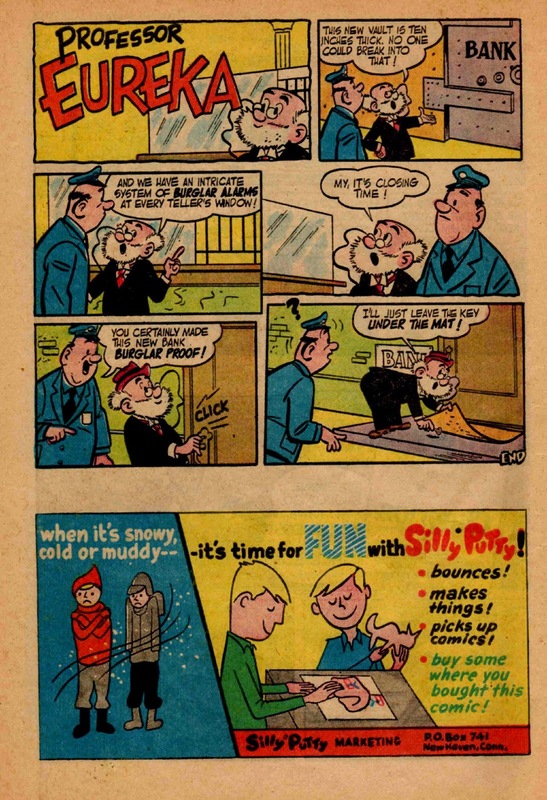 Silly Putty is still around, of course, and it WILL lift print or comics from a newspaper. But don't try that trick on one of today's comic books -- they're too glossy and improved, dontcha know. Here is the first page of our cover story. Both the tale (script by Leo Dorfman; art by Swan & Klein) and its telling are superb. We start out with a seemingly odd occurrence, and eventually find an explanation. This particular story illuminates some Kryptonian past, as well as examining the impact of "total truth" on society. Regarding this first page ... Don't you love the "BOFFF!" sound effect in Panel One when the kid crowns Superman? And isn't Superman's honesty at the Baby Pageant refreshing? What a great expression on his face as he lays out the "rude" facts. This subscription page is not only prime fodder for the those-were-the-days crowd, it's also a bit of a conundrum. You see, I assume that these ads were set up long before the particular issue in which they ran. Memory tells me that they were commonplace in DCs of the times. What intrigues me is that one of the art pieces from this ad is from a story IN THIS VERY COMIC BOOK! That's right. The blog post from a week ago contains it. To me it seems a bit of recursive comic-book magic. 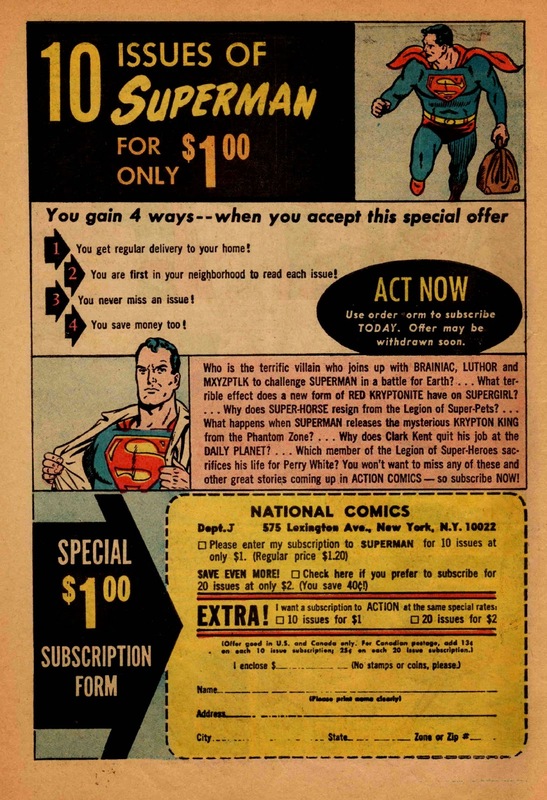 I am certain that the upper image in this ad, Superman running with a money bag, is likewise from a published story ... but my old brain can't recall it. Any suggestions? "Jerry the Jitterbug" was one of those often-encountered gag strips. Comicvine tells us it was by Murry Boltinoff; The Comic Book Database tells us it appeared in a bunch of titles, without giving specific issues. The bottom half of the page is a typical ad for Cheerios. 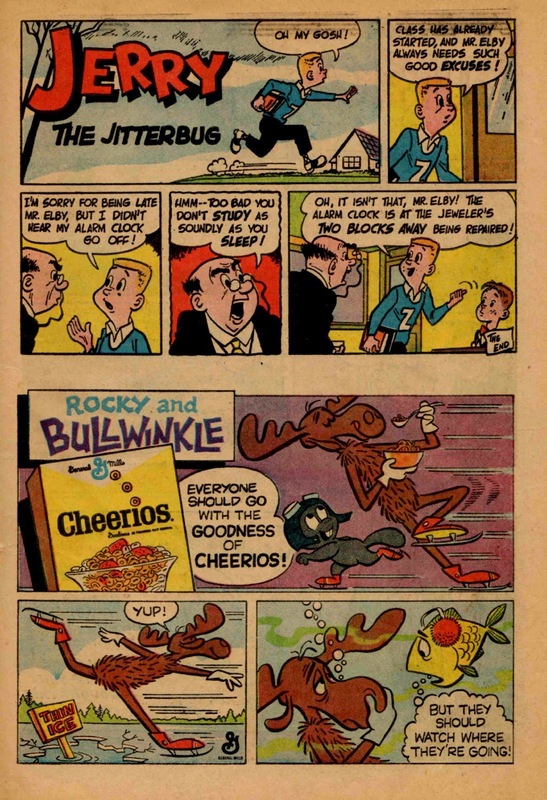 These Rocky-and-Bullwinkle Cheerios ads kept running long after the original network runs of the cartoon (1959-1964). But this ran about the end of the show's first-time run. Syndication kept it evergreen, of course, into the 1970s.